Happy 4th of July! (Happy wedding month!) Happy summer! 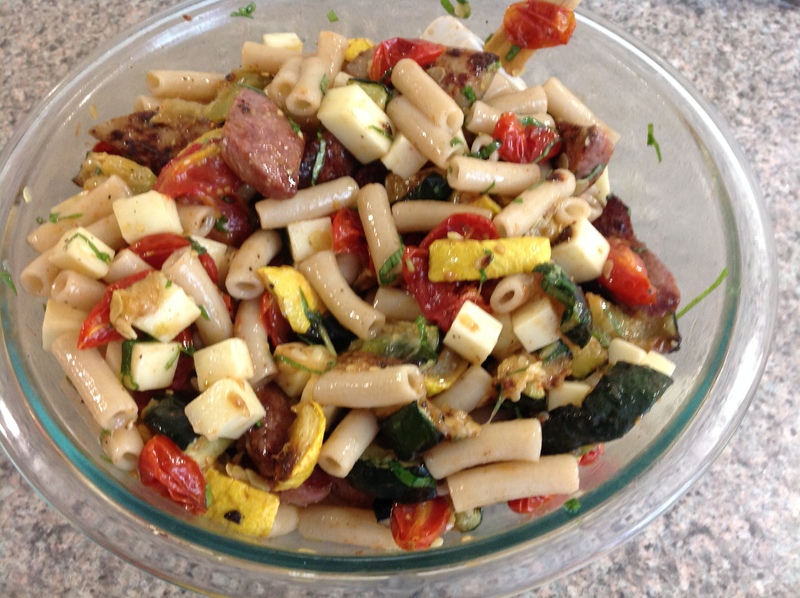 If you’re looking for a delicious potluck picnic dish this July 4th, here is a crowd-pleasing pasta salad recipe. I based the idea on a simple salad my mom used to make for us in the summer. She’d mix pasta, kielbasa, chunks of cheese, and fresh veggies and toss them in a light vinaigrette. It made a nice summer salad because all you had to do was cook the pasta and the rest was assembled cold. 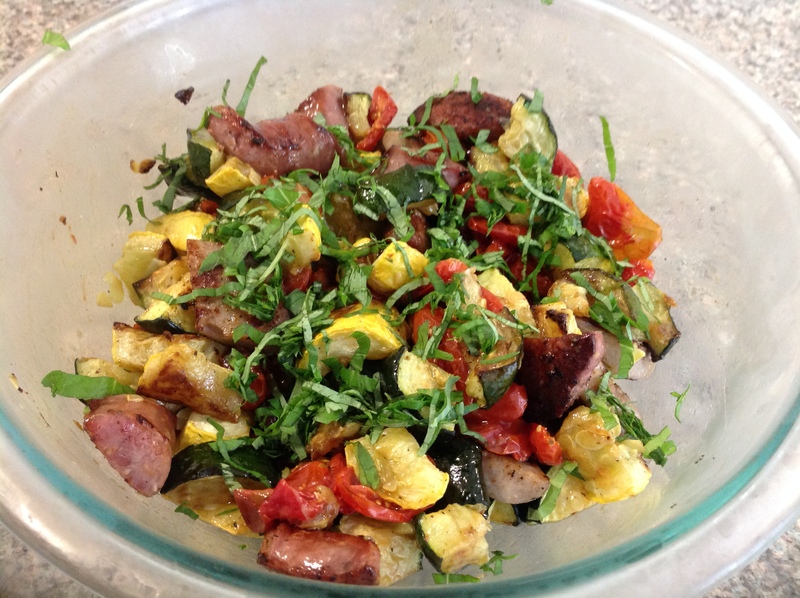 My version calls for roasting the vegetables and pan-searing the sausage, which adds an extra layer of flavor that is not to be missed, though these steps do add extra time and labor and if it’s too hot to run the oven you might be tempted to skip it. However, if you make a big batch of this, you only have to run the oven once and you have lunch for the whole week. Try it once. I promise it’s delicious. To roast your veggies, simply chop them up into even pieces (not too small as they do shrink slightly when roasting). Coat lightly with olive oil and sprinkle with salt and pepper and roast at 400 degrees on a parchment lined baking sheet. The key to good roasting is spreading them out so they don’t touch each other. Look at these beautiful roasted grape tomatoes! Pan-sear the sausage for extra flavor. First cut the links in half lengthwise and then into bite-size pieces. Sear in a hot un-greased skillet for a few minutes on each side. 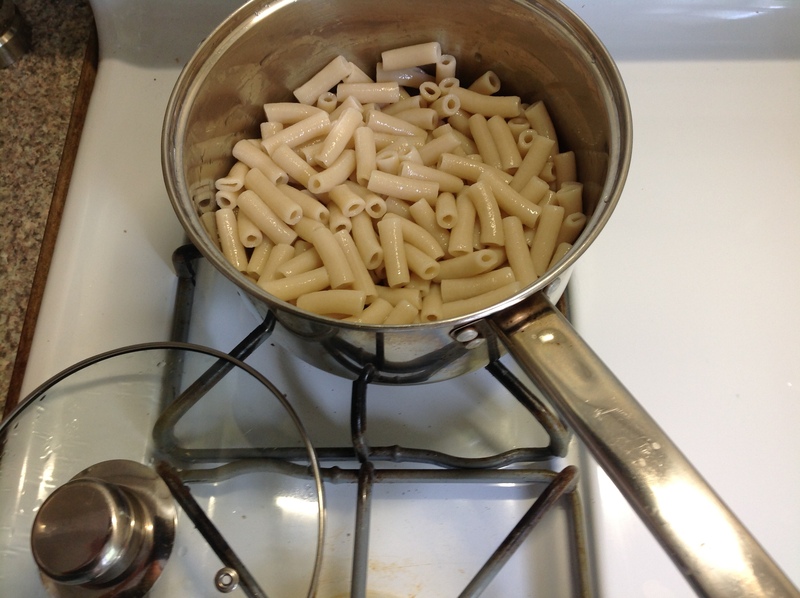 And then your pasta of course – I chose Tinyada rice noodles this time. Add a splash of balsamic vinegar and a splash of olive oil. Add your favorite cheese in cubes. Refrigerate until serving time! Half the tomatoes lengthwise and toss with a small amount of olive oil, salt and pepper to taste. Feel free to add a few whole cloves of garlic to roast with them as well if you like. Spread out on a parchment paper lined sheet pan and roast in the oven while you cut the squash. 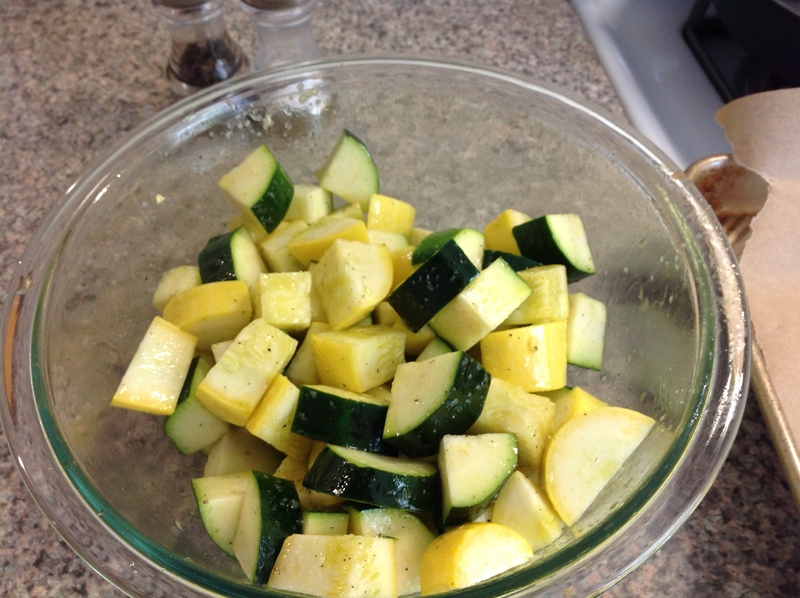 Dice the zucchini and squash into bigger than bite-size cubes (they shrink as they roast) and toss with oil, salt, and pepper. Spread out on a parchment paper lined sheet pan and put in the oven with the tomatoes. 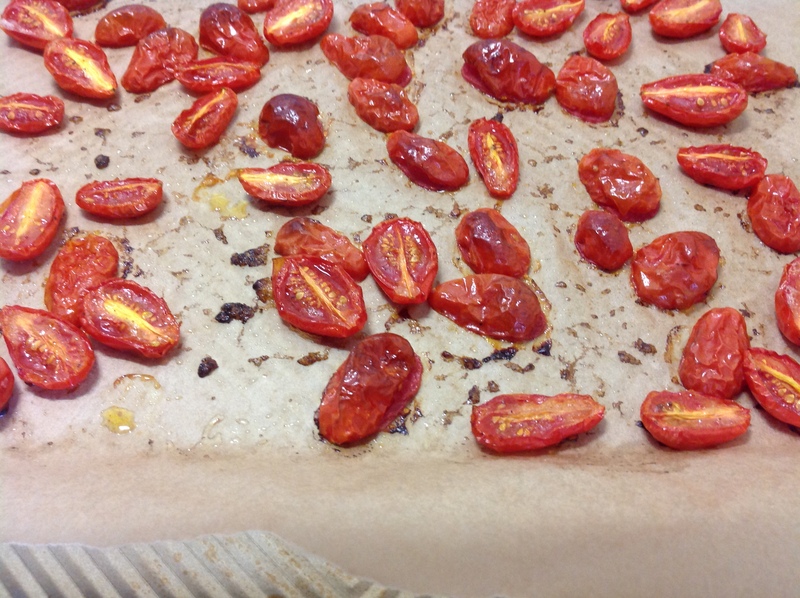 Roast the tomatoes until they begin to shrivel and caramelize slightly, probably 25-35 minutes. Roast the squash until it browns slightly, turning the pieces and stirring them if desired for more even browning. 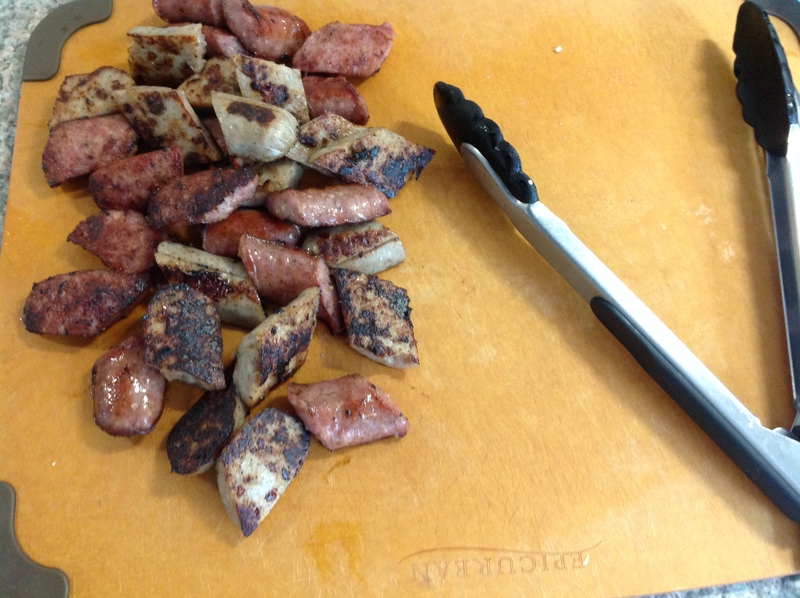 While the veggies are roasting, prepare your sausage. Slice in half lengthwise and cut into bite size pieces. Heat a large skillet on the stove over medium heat. When hot, add some of the sausages cut side down without any oil, (being sure not to crowd them) and cook for a few minutes before flipping to the other side to cook for a few minutes more. Remove the cooked pieces and cook the remaining sausages the same way. Let cool. Meanwhile cook the pasta according to package directions (I recommend in lightly salted water), drain, and rinse with cold water. Pour the pasta into a large bowl and toss with a splash of balsamic vinegar (start with 1 tablespoon at a time) and a bigger splash of olive oil. 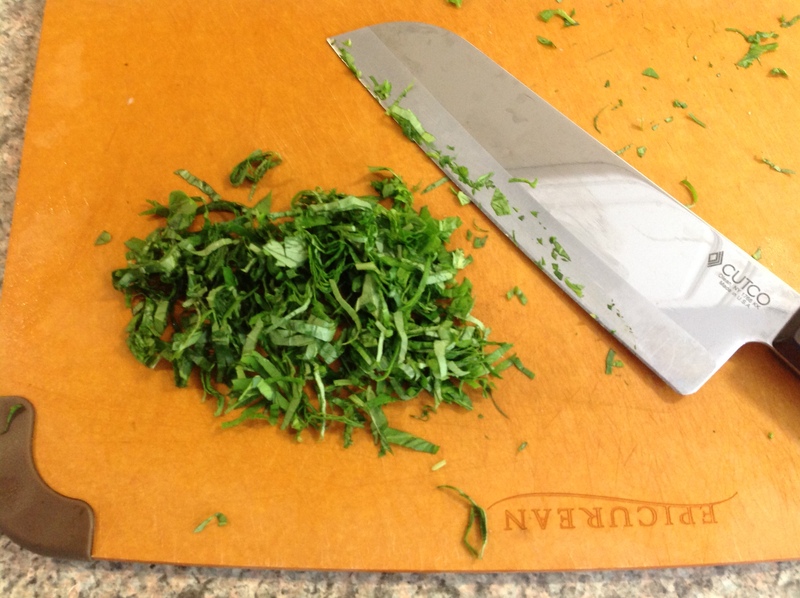 Sprinkle with black pepper and your fresh basil chiffonade. Toss well to coat. 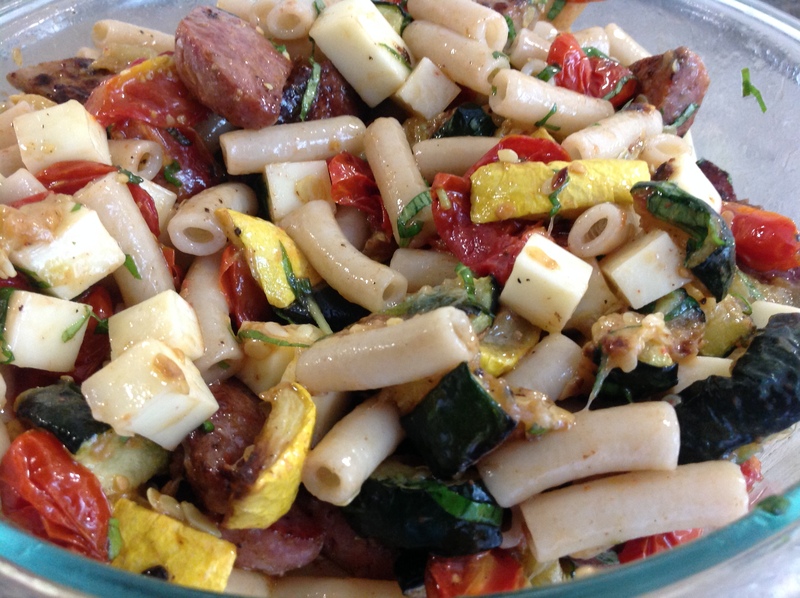 When vegetables and sausage have cooled, carefully stir them into the pasta. Taste and adjust seasoning as necessary by adding more vinegar, oil, salt, or pepper. Add the cheese cubes or keep them on the side until ready to serve. They will be fine if you mix them in now, though they do become a little softer. Refrigerate or serve slightly warm as is.